1821. Manchester Guardian 5th May. 1856. Improvements in Looms for Weaving. 1858. Mechanism for Engraving and Copying Designs. Engineer and prolific inventor and manufacturer, who significantly influenced the development of a very wide range of machinery. His development of precision machine tools contributed to the birth of production engineering and mass production. He introduced significant improvements to various types of textile machinery. Roberts was educated by the parish priest, and early found employment with a boatman on the Ellesmere Canal and later at the local limestone quarries. He received some instruction is drawing from Robert Baugh, a road surveyor working under Thomas Telford. Probably in 1813, Roberts moved to a supervisory position in the pattern shop of the Horseley Ironworks, Tipton. He had gained skills in turning, wheel-wrighting and the repair of mill work. He was drawn for the militia; to avoid this, he went to Liverpool but, finding no work there, moved to Manchester, where he found work as a turner for a cabinet-maker. He then moved to Salford working at lathe and tool-making. 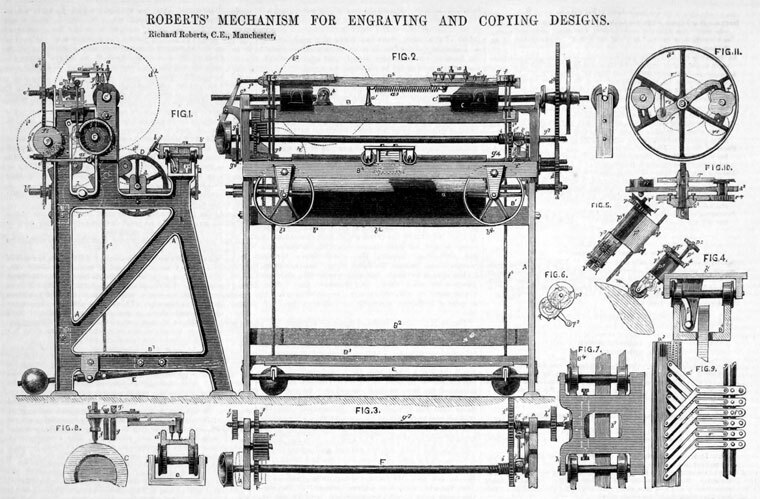 1816 Roberts built a range of machine tools, some to his own design, the first being a gear-cutting machine. For accurately checking the dimensions of the gears he adapted the sector, which he developed for sale to other engineers. Roberts adopted rotary cutters, which he had seen used at Maudslay's. 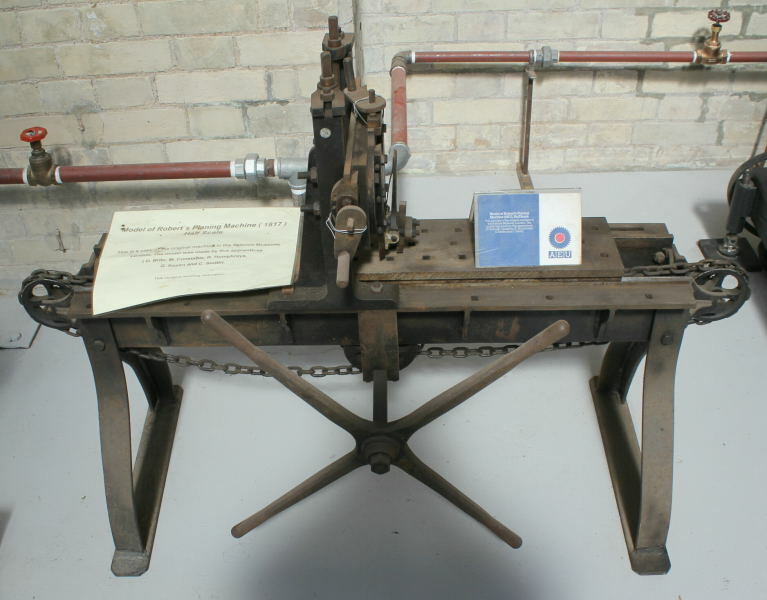 This is one of the earliest records of a milling cutter used in engineering. 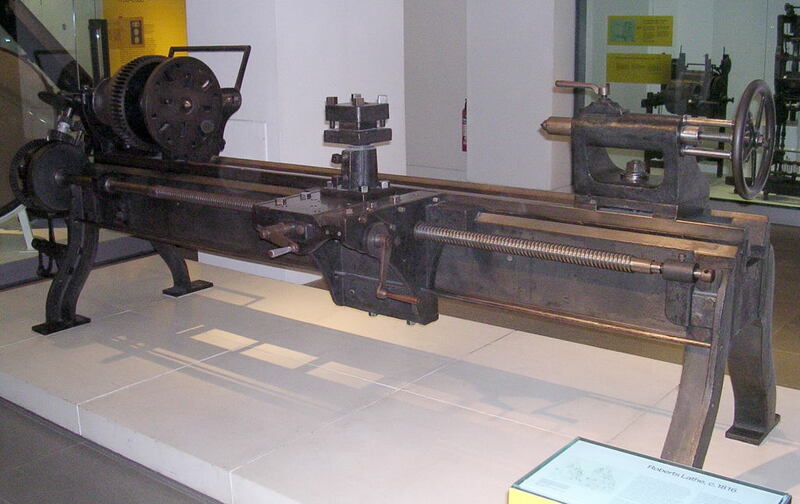 1817 He made a lathe able to turn work 6ft long. This had a back gear to give an increased range of speeds, and a sliding saddle to move the tool along the work. The saddle was driven by a screw through gearing which could be disengaged when the end of the cut was reached. 1817 He built a planing machine to allow the machining of flat surfaces. Previous to this flat surfaces were laboriously made by hand with the fitter using hammers and chisels, files and scrapers to get a true surface. 1819/20 Listed as 'Roberts Rich. lathe and tool maker. New-market; house 5 Water st. Bridge st.
1822 He patented a power loom. This was made entirely of iron and, being precision-made, was able to operate at high speed. They were turned out at the rate of 4,000 per year by 1825. 1823 Thomas Sharp and Richard Roberts entered into a formal partnership. Sharp guided Roberts into commercial ventures and their seven patents were largely profitable. Whilst developing his textiles machines, Roberts also took as partners Robert Chapman Sharp, Thomas Jones Wilkinson and James Hill. They formed two firms, Sharp, Hill and Co and Roberts, Hill and Co. In 1824 Roberts invented his most famous machine, the self-acting spinning mule, and patented it in March 1825. 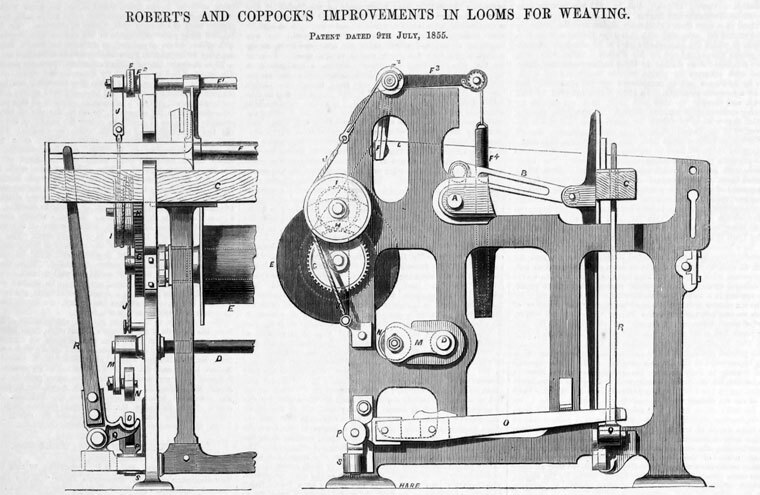 Improvements were made, and Roberts took out a new patent in 1830. 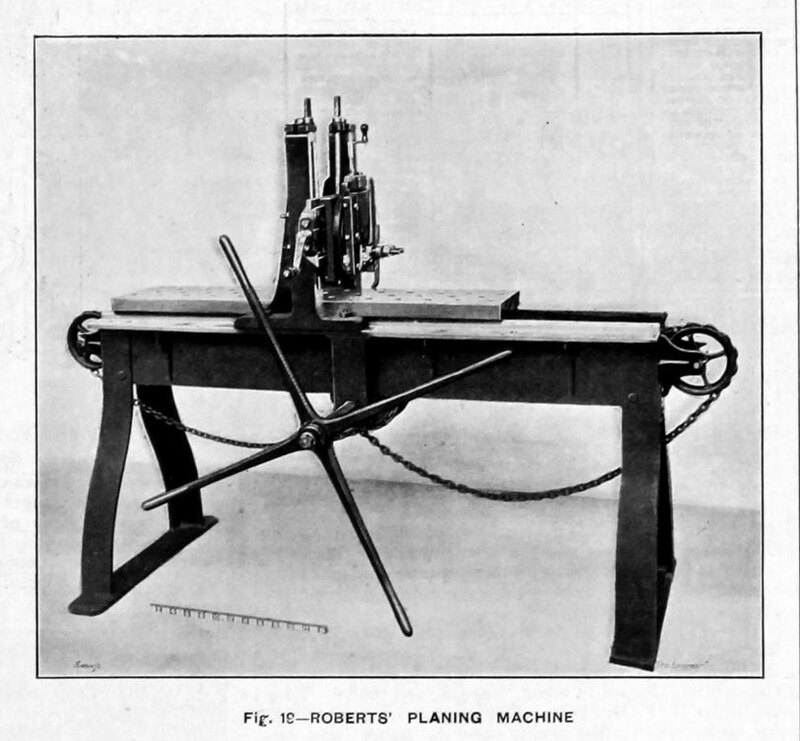 The machines were made in hundreds, and Roberts made extensive use of templates and gauges to standardise production. 1830 Patented an improved version of his self-acting spinning mule, which proved the key breakthrough, establishing the principle upon which self-actors were built for over a century. 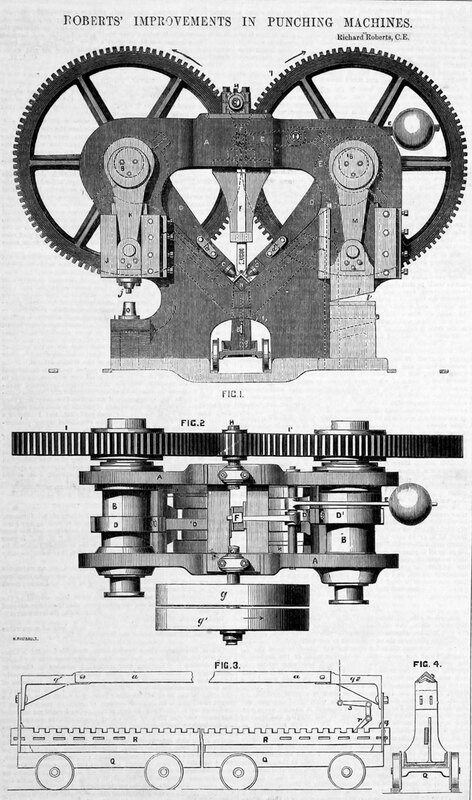 1825 He invented a slotting machine to cut key-ways in gears and pulleys to locate them on their shafts. Previously this was done by hand chipping and filing. The tool was reciprocated vertically, and by adopting Henry Maudslay's slide rest principle, he made the work table with a universal movement, both straight line and rotary so that the sides of complex pieces could be machined. 1826 May. The two companies were amalgamated to form Sharp, Roberts and Co. The firm later became well-known for making locomotives. 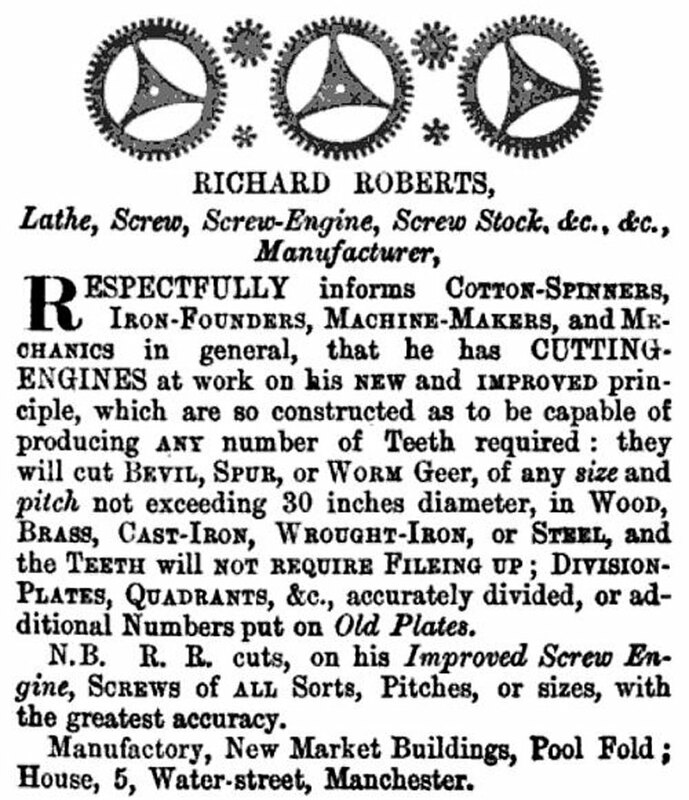 Roberts also manufactured and sold sets of stocks and dies to his range of pitches, so other engineers could cut threads on nuts and bolts and other machine parts. His inventions had a seminal influence on other machine-tool engineers, including Joseph Whitworth when he came to Manchester a decade later. Sharp and Roberts took out 7 patents, which were largely profitable. c1832 Married Eliza. Believed to be his second wife. She died between 1841 and 1851. 1835 Birth of his daughter Eliza Mary who married Paul Theodor Luboldt (son of Frederick Wilhelm August Luboldt of Gera Reuss, Germany), a General Merchant, of London, on the 16th May 1867 and died 9th July 1869 at Worthing. They may have had a son but not living with his father after Eliza's death. 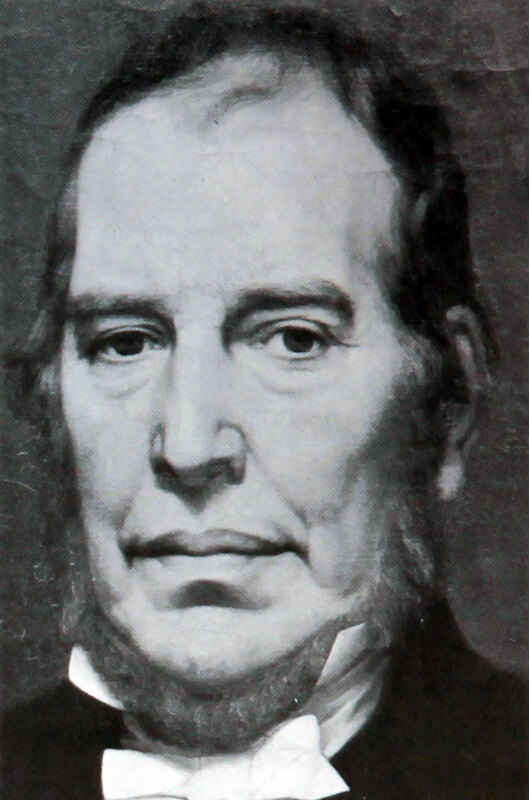 1838 Richard Roberts of Manchester, became a member of the Institution of Civil Engineers. 1839 Application to extend his patent of 1825. 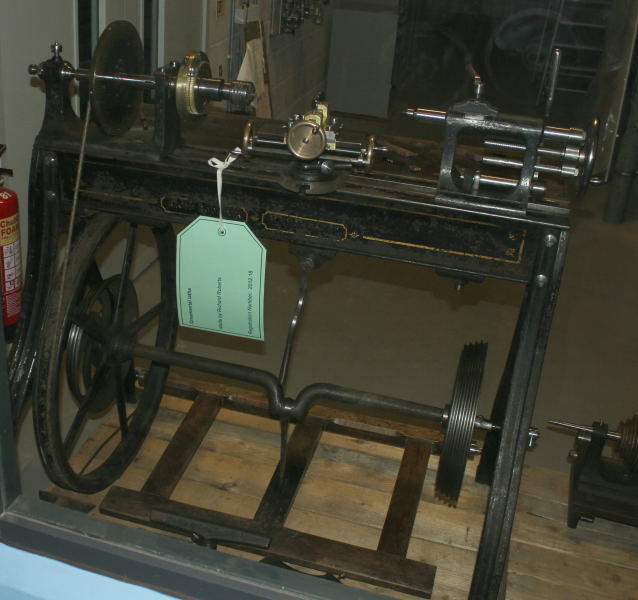 1841 Roberts took out 22 patents after Sharp's death in 1841; all were commercial failures although one was possibly the first digitally-controlled machine tool - the heavy Jacquard-controlled plate-punching machine Roberts made in 1847 for Stephenson's Menai Bridge. 1841 Listed as Roberts, Richard, engineer. h: 14 Cecil street, Greenheys . 1843 After Sharp's death, the partnership was dissolved; Roberts carried on business Roberts and Dobinson at the Globe Works, Faulkner Street, with Robert Graham Dobinson as partner. 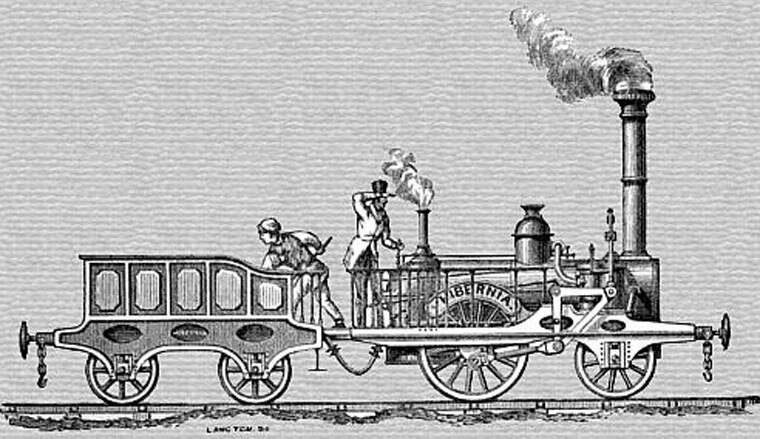 1849 'Curious mechanical contrivance' brought before the British Association by Richard Roberts of the Globe Works. 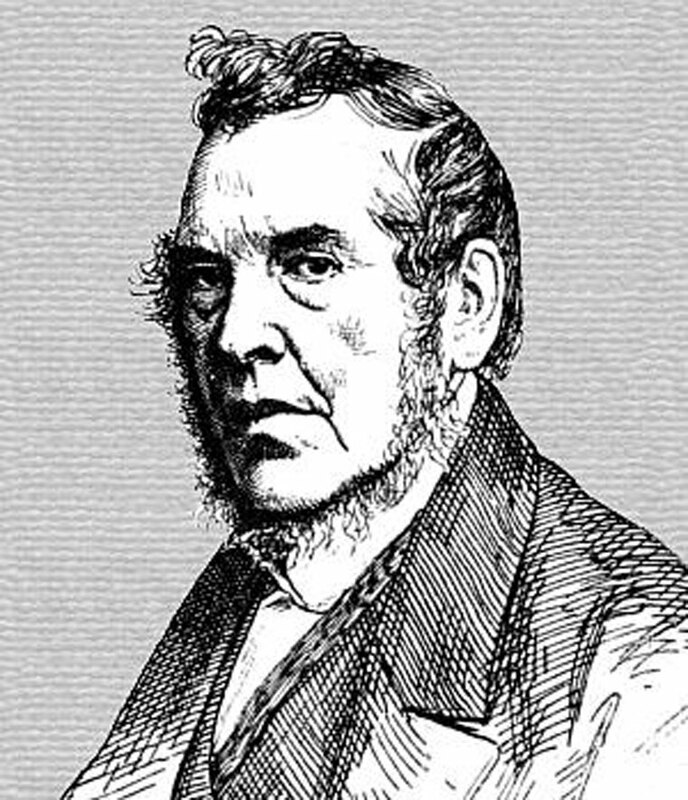 1852 Roberts became a consulting engineer, first at the Globe Works, Manchester, where he interested himself in omnibus design, traction engines, and screw-propelled ships; his partner for some time was Captain T. E. Symonds, R.N. 1858 February 24th. Patent. Richard Roberts, of Manchester, civil engineer, for improvements in mechanism for engraving and otherwise copying in line paintings and other designs, flat and curved surfaces of metal, paper, and other materials. . This was illustrated and described at great length in 'The Engineer'. He attempted developments in coal-cutting machinery. 1864 March 11th. Died aged 74 of Adam Street, Adelphi, London and late of Manchester. On his final day he was designing a slate-cutting machine. Recognizing his services, the government granted a civil-list pension of £300 to his daughter. 1864 Obituary, page 175 of The Engineer 1864/03/18 and page 183 The Engineer 1864/03/25. This page was last edited on 27 January 2019, at 17:11.